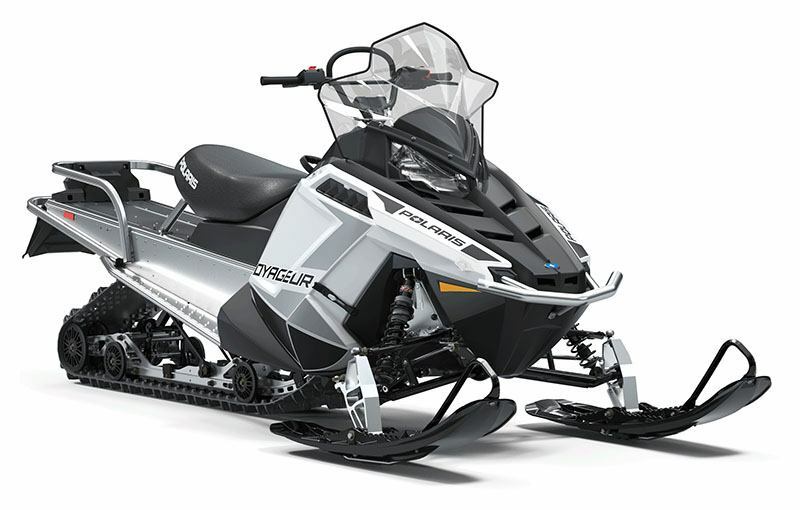 For riders looking for an all-purpose sport-utility snowmobile - plus the reliable performance and great value of the fan-cooled, durable 550 engine. PRO-RIDE™ FRONT SUSPENSION: Nimble yet stable, the adjustable PRO-RIDE™ front suspension delivers superior ride performance and handling on- or off-trail. RYDEFX® MPV SHOCKS: RydeFX® shocks provide a great foundation for riding and handling when boondocking. INDY® PRO-RIDE™ SEAT: A wider surface provides enhanced comfort during long days on the snow, and the seat design allows easy transition between seated and standing positions. PRO-RIDE™ CHASSIS: The PRO-RIDE™ chassis of the 550 Voyageur® 155 is stiff for precise, intuitive handling that makes it the ideal choice for a nimble sled that's fun to ride. ARTICULATED REAR SUSPENSION: The 155 rear suspension features an articulated rail for the best off-trail snowmobility and to prevent trenching when backing gup. The rail tips up at the rear so that the track can rider over obstacles and is easier to back up. PRO-FLOAT SKIS: The strong, lightweight PRO-FLOAT skis provide outstanding off-trail flotation and unmatched on-trail steering and control. These skis feature a unique dual, stepped keel design that provides more responsive deep snow handling as well as outstanding handling on the trails. The upturned rear edge accommodates backing up over obstacles, and the serrated top of the ski provides traction for a rider's boot. HIGH-FLOTATION 155 IN. TRACK: The 1.6" Cobra track features deep lugs with a cupped design to deliver outstanding off-trail performance. The lugs provide great deep snow traction and their stiffness ensures great on-trail performance as well. INTEGRATED STORAGE & CARGO RACK: Storage was developed with the AXYS® platform, so it installs securely without tools and features seamless, integrated styling that matches the sled's design lines. Sturdier zippers provide better cargo security and protection. Underseat storage comes standard with the Voyageur® 155. HITCH: The hitch is hinged low for greater versatility and better towing. 155 x 15 x 1.6 in.